Half brother to Foxvangen’s Pharaoh, Solaris is bred for endurance, speed and stamina. Solaris is free moving and efficient in motion. 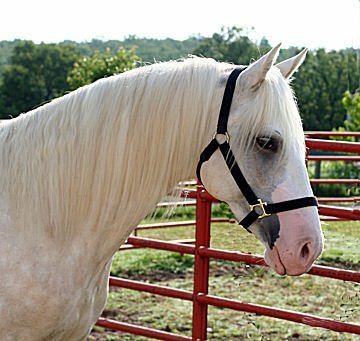 He loves to gallop at speed and his gaits are 100% natural. No pace, no gimmicks, no special angles or devices needed! He naturally foxtrots, running walks and flat walks with lovely flowing action. 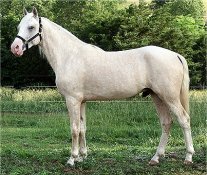 He is bred to produce exceptional distance horses, field trial horses, competitive and timed trail horses, model, pleasure and trail horses. Solaris is puppy dog gentle, kind and loving besides being very willing, and highly intelligent. Standing 15 hands he is likely to grow a bit yet. 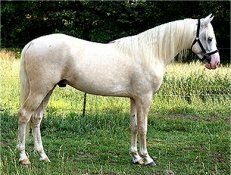 He is an Isabella ( light) palomino sabino testing positive for SB1. He will put color and chrome on his offspring. If you are looking for bone, joints, quality and exceptional efficiency in motion,as well as a smooth glide ride, Solaris is the boy.